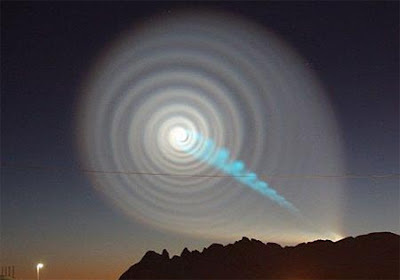 A RUSSIAN MISSILE OR AN ATMOSPHERIC PHENOMENON? On December 9, 2009 a strange phenomenon took place in the Norwegian sky creating a big blue spiral that was seen by many people. At first Russian authorities said that it was a missile that had a failure, later on, these authorities denied the previous declaration by saying that they did not launch a missile and the Norwegian government was well-informed of this case. The truth is that there was a missile, but the explanation of this unusual phenomenon is still a mystery for the Russian scientists, who don’t even imagine what happened with their missile and the nature of the failure. Interlocutor: The topic I want to ask you about is related to the mysterious phenomenon that took place in the Norwegian sky. Ruanel: There was a kind of “energy crossing” in a certain way that appear more in the North Pole than in the South Pole, and just like there are certain type of lights, there are also aurora borealis and electric glows that can end up opening small holes in the atmosphere. They would be rather micro holes. Interlocutor: Obviously we are speaking of a natural phenomenon. Ruanel: Correct, but in this case it was a natural phenomenon that only happens in certain regions where there are certain atmospheric conditions. Interlocutor: Did this happen previously at some time or it was a unique phenomenon? Interlocutor: Was this phenomenon produced by a Russian missile? Ruanel: The answer is yes, but only in a certain percentage. Ruanel: That missile crossed with its tip through that energy vortex, the missile continued its trajectory. It didn’t disappear, until it finally fell. Interlocutor: Did the luminous phenomenon have to do with the failure of the missile? Ruanel: The missile, somehow, was as you call a guided missile. In fact, what provoked the failure was a "short circuit". This is not the exact word, but I don't know how to transmit to this vessel this concept more clearly since it’s a very complicated term to be translated into spoken language. In short, that "short circuit" caused by the impact of the missile with the energy vortex produced a flaw in the system of the missile and that whole group of circumstances missile –atmospheric phenomenon -short circuit – failure, originated the luminous anomaly that was seen in the Norwegian sky. Interlocutor: Can we say that the Russian missile didn't fail due to human mistakes, but due to atmospheric factors. Interlocutor: From the point of view of the Russian scientists, They know that the guided missile failed, but they don’t want to admit it. Am I right? Ruanel: Yes, they have acknowledged that it failed. Interlocutor: However, I have read that they even denied that they had launched a missile to the space. Ruanel: They are denying it now, but in a certain moment they didn't deny it. Interlocutor: In short, they denied what they had said before. The famous phrase “they gave with one hand and took away with the other.” Could be applied here. In fact the Russian scientists know that the missile failed but they ignore the cause of the failure. Ruanel: Yes, they ignore the cause of the failure and they are wondering about it, nonetheless, there are qualified physicists that suspect that the guided missile had, to say it somehow, an “atmospheric- space anomaly.” You may call it as you like. Interlocutor: In conclusion, the bright spiral in the Norwegian sky was produced by a lot of fortuitous circumstances that provoked a failure of a Russian missile that impacted with an atmospheric phenomenon (energy vortex) that in turn provoked a short circuit in its system that made it fall. Interlocutor: Well, Master, I believe that this issue has been explained clearly, we can conclude the topic here. This entry was posted at Thursday, February 25, 2010 and is filed under Secrets . You can follow any responses to this entry through the .